For many writers, the Toronto IFOA has such a pedigree that it marks a high point in their promotional lives. If, however, you’re on the tour, it’s just another meeting of the “Floating World” of authors. So the hospitality suite is a place of festival reunions (“Hey, I missed you after Banff. How was Vancouver?”), and I was glad to catch up with many friends from earlier festivals, and with old friends like Elizabeth Hay, who once graced the delightful Tepoztlan Canadian festival in Mexico, and whom I’m proud to have published. I ran into David Adams Richards, and learned that one chapter in my book is out of date. Talking about Jack Hodgins, I lament the fact that perhaps I gave him bad advice by urging him to stay far away from Toronto. To make my point I note how well my friend David’s career has developed since he abandoned New Brunswick and moved to Toronto. David gently reminded me that after many years in Toronto, he moved back east, to Fredericton, two years ago. 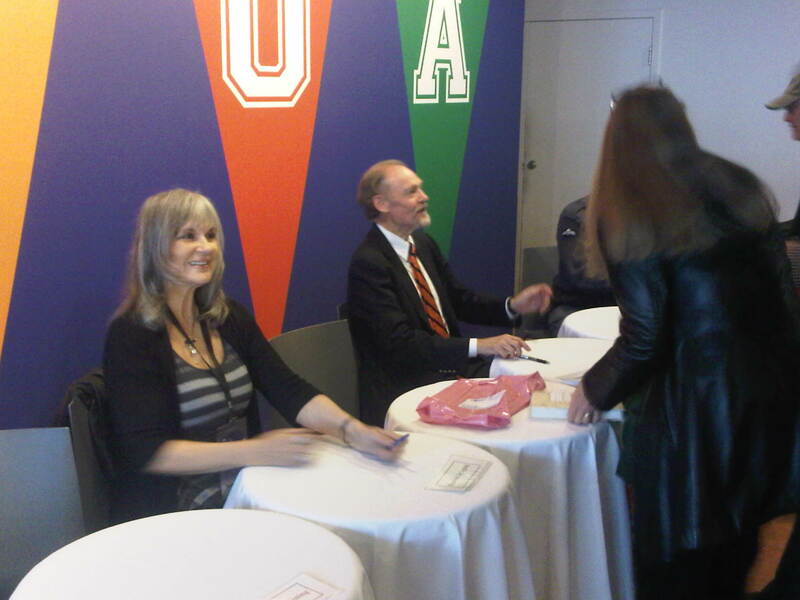 Signing after their IFOA event, Sylvia Tyson and Douglas Gibson. As for the show, I had the surprising honour of having Sylvia Tyson precede me (“I once had Sylvia Tyson open for me” is a good boast for posterity. ) Her reading from her novel was punctuated by occasional songs. When I followed her, in the course of my one-hour show, I sang one line, which gives me room for a tiny singing boast. I’m still working on it. This entry was posted in Dispatches from the Road and tagged IFOA, toronto, Tour.